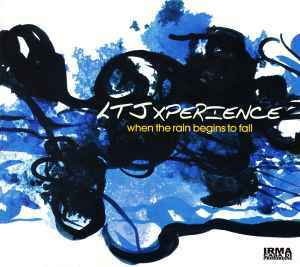 The LTJ X-Perience continues with When The Rain Begins To Fall, mixing jazz and several forms of deep house and downtempo. The production and structure of the tracks are even better this time around. "Empty Streets" is an immediate highlight, because of its athmosphere and awesome trumpet work. The whistling seems off-kilter the first time you hear it, but actually fits the track very well. "El Toro" combines deep beats with smooth rhodes and a nice trumpet, while "Cocos" utilizes flute improvisation over mellow rhythms. The percussion based "Dancin' Percussion" shows off cool keyboard work and the bright "Latin Impulse" is notable for its lenghty build-ups and nice synths. "Logic Bossa" is a cheeky groove, but unfortunately the saxophone solo on the second half is not very good. I'm not too fond off the vocals of Joe Bataan on "Ordinary Guy" and the title track either. Silvia Donati, on the other hand, does a very good job with her sensual voice on the happy Brazil-inspired "Vamos Pra La", which is another standout (check that fantastic piano work!). The romantic remix of "And I Love Him" is pleasingly smooth, while my personal favourite, "Feel my Soul", is much darker than the other tracks, but has a beautiful twist towards the end. Absolutely worth looking into!